Resilience is a term that is bounced around a lot when discussing ways our forests can adapt to changing environments. But, what does it mean? Basically, it’s the capacity of a forest to withstand (absorb) a disturbance or external pressure and return, over time, to its pre-disturbance state1. We all would like our forests to be resilient in the face of natural disturbances such as fire, insects, disease and wind so they can keep providing us with clean water, wildlife habitat, beautiful vistas, grass for livestock and timber production. We want to protect what we have. A resilient forest is one that will experience disturbance, for example fires and insect outbreaks still occur, but will both withstand the disturbance without major change and grow with the components they had before the disturbance. Because a changing climate may bring new types of extreme events, it is important to engage management methods that promote resilience so that forests may have a higher chance of returning to desired conditions. Eastern Oregon has experienced a significant trend of increasing temperatures during the summer months, a decreasing moisture trend and more fire activity. Our springs tend to come earlier and falls stretch out longer. 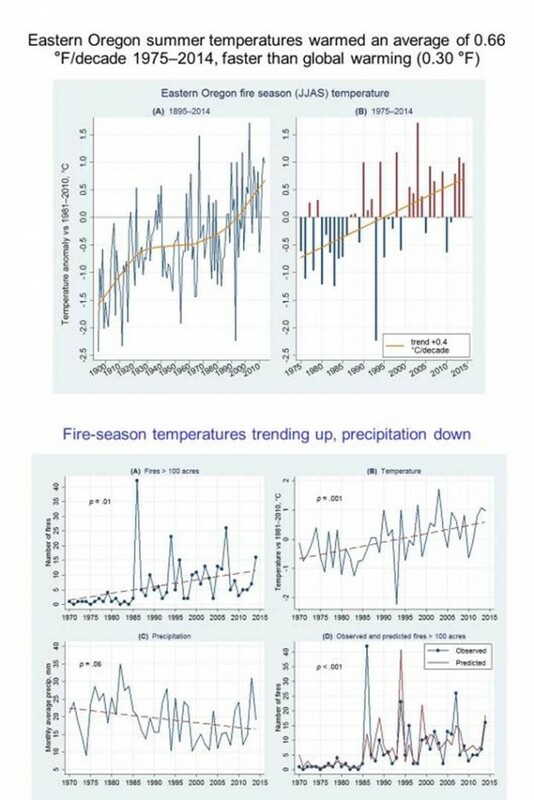 We’ve seen a documented increase in the length of fire seasons, fires that are hotter and more difficult to put out, and increased moisture stress on trees. What can we do to create forests resilient to these pressures? It is generally assumed that “healthy” forests are more resilient to change2. The answer then has to do with applying forest practices that are preventive and can alter forests from an “unhealthy” to a healthy condition. Left: Dense dry forest, more susceptible and less resilient to wildfire and insect pests. Right: Thinned dry forest, less susceptible and more resilient to wildfire and insect pests. Thinning that includes fuels reduction operations in dense forests. If you pile the slash in a thinning, be sure and go back and burn the piles. Studies have shown that when slash piles are left on site, treated and untreated areas burn the same. On steep slopes thin a bit wider because flame lengths are longer. Work with your neighbors to help make your forests more resilient through collaborative preventive practices that decrease wildfire, insect and disease risk. When thinning, leave the most vigorous trees, those with long crowns and healthy foliage. Develop a wildfire preparedness plan that includes considerations for building new ponds or upgrading existing ponds to allow for pumper or helicopter access, maintaining or expanding adequate ingress and egress, and establishing fire breaks at high risk areas along your property boundary. Adopt forest management practices that lower risks from insects and disease such as sanitation/salvage cuts, fostering a diverse forest, knowing locally important insects and diseases and how to mitigate infection risk. Promote diversity in terms of species composition, forest structure, stands of different ages, and include snags and large downed wood. Be vigilant about conducting early detection, rapid-removal of any new invasive exotic plants, insects, diseases and animals in your area and forest. Take care to match the best species for the site conditions. Understand tree tolerances and biology, and implement management practices including planting and thinning that match the right species to the environmental conditions, e.g. plant more drought hardy trees, like ponderosa pine, on south and west slopes or rouge out grand fir during thinning if it is growing on drier sites. Be more aware of vegetation competition when planting and control competitors where needed even on better sites. Grasses and other plants aggressively compete for water and nutrients and planted seedlings have a tough time competing, especially the first couple of years after planting. 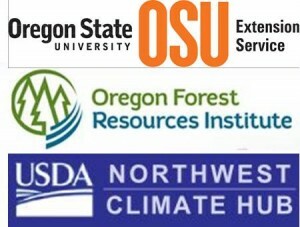 In summary, creating or promoting resiliency in the dry forests of Oregon hinges on a multi-pronged approach. It’s about knowing your forest, and developing a preventive management strategy that includes enhancing diversity across the landscape, promoting the health and vigor of trees and stands, decreasing wildfire risk through practices such as wide thinning and fuels reduction, and being proactive and prepared in the event of a wildfire. 1Thompson, I., Mackey, B. McNulty, S., Mosseler, A. (2009). Forest resilience, biodiversity and climate change. A synthesis of the biodiversity/resilience/stability relationship in forest ecosystems. Secretariat of the Convention on Biological Diversity, Montreal. Technical Series no. 43, 67 p.
2Promote Resilience to Change, March 16, 2015. In: Climate, Forests & Woodlands Community of Practice.